So the big day had come with both teams having done a great job to be in the final. Our girls took a 2-0 lead and looked comfortable but Doncaster Belles never gave up and managed to sneak a goal back to get them into the game. In the 2nd half our girls looked nervy and the Belles capitolised on a defensive mix up and evened the score at 2-2. The game went to extra time and our girls pushed for the winner but Doncaster defended brilliantly and with no extra score it was time for the lottery of penalties. There were penalties missed by both teams but it was the Belles who held their nerve and lifted the cup. 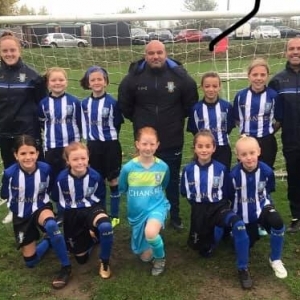 There were some tears from our girls at the end but in football you win some and you lose some and they should hold their heads high and celebrate getting through the whole of the competition unbeaten up until the penalty shootout. Well done girls and well done to Doncaster Belles on coming back from 2-0 down to lift the Cup. The girls celebrated a great season with a slap up meal at TGI’s after the game where the smiles all returned.